Mom, the Intern: Tom Cruise's stunt double. The first time I ever saw Dill, I thought, "Dang! That is one fine lookin' son-of-a-gun!" Tall, dark and handsome. Our first encounter was a blind date, and afterwards I felt like maybe I should play the lottery or at least buy a Scratchers card. That kind of luck is not to be had on 99% of blind dates. Fact. The second time we went out, Dill drove us to a church function. That was the first time I'd ever really seen his profile, since I was riding in the passenger seat. At one point I looked over to sneak a peek of his handsomeness when I suddenly thought, "Holy crap, I'm dating Tom Cruise how did that happen?!" I mean, seriously. And apparently EVERYONE agrees. Co-workers, family members, even his fellow background players from the Life of Christ Bible Videos. I often finish people's sentences when they say, "Oh wow, your husband looks just like -- "
Me: "--Tom Cruise, I know." And then they are astonished by my Legilimency skillz. Last night while brushing our teeth, Dill and I were talking about his uncanny resemblance to Mr. Cruise and Dill said, "You know, I probably could be his stunt double!" To which I thought, No, because Tom is really short and you are not. 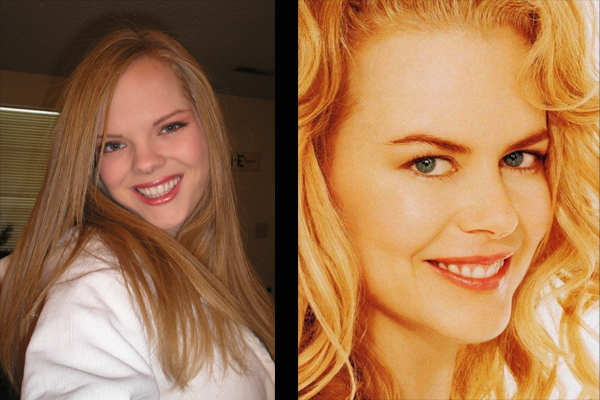 It's funny, though, because prior to meeting Dill I was frequently told I looked like Nicole Kidman. You know, the stunning Australian actress who was married to Tom Cruise for forever. At the time Dill and I began dating, Tom and Nicole were already a thing of the past so I tried not to draw attention to our resemblance. Bad omen, since our celebrity doppelgängers were fated for divorce and all. But if anyone was truly heartbroken about the demise of Tom and Nicole, take heart -- their marriage lives on in us! So who do you look like? Your significant other? Don't forget -- my dad is Donny Osmond. Too bad Tom does all his own stunts. He might have a real job possibility! Once upon a time people used to tell me I resembled Ann Hathaway, but I think it was just a long hair thing. I don't have her lips, like, at all! Hahaha that's awesome!!! You totally do look like her! What a pretty pair! People still tell me I look like Tiffani Amber Theisan (sp). I think I look like a fat version of her. My hubby looks a LOT like Chris O'Donnell. In fact, that is the first thing I thought when I saw him. Not me, but my husband looks just like Matt Damon! I get Jennifer Love Hewitt when I actually do my hair and make up. 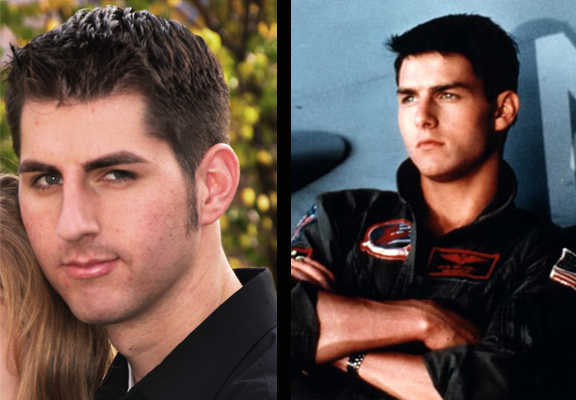 dillon really does resemble tom cruise. good thing he's not a psycho like him though. and i definitely see the nicole kidman resemblance too.